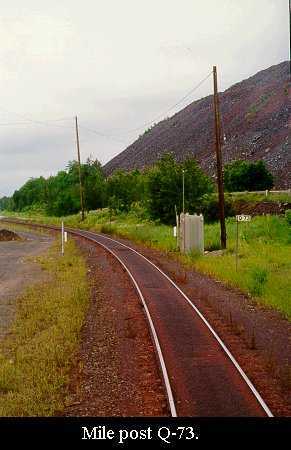 The ore being mined at Empire and Tilden were once considered worthless rock as our technology was not able to extract the iron bearing material.Today only low grade ore like these are mined in the United States. If this technology were not developed we would have been forced to look elsewhere for our iron supply, as we do with our copper supply. The Tilden, in addition produces non-magnetic hematite ore. 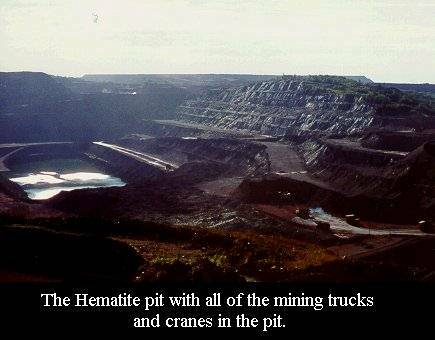 The hematite pit lies in an area 2 miles long by 1/2 mile wide. From this one pit the Tilden holds 300 million tons of ore yet to be processed. 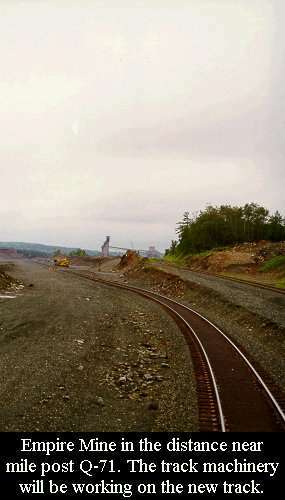 The newly opened (1989) magnetite pit at Tilden contains approximately 60 million tons of ore, or about 15 years of production. The mineral and rock is first stripped by blasting the rock with explosives and removing it with 190 ton capacity trucks.. The ratio of mineral to rock is 1.5 to 1 for hematite and 1 to 1 for magnetite. The material is stored in a covered building after being reduced to no greater than 10 inches in diameter in a primary crusher. The material is about 35% iron and therefore in order to produce 6 million tons of pellets requires 30 million tons of ore and rock combined. At Tilden, where both of these minerals are found, only one can be processes through the mill at a time, which depends on customer needs. The next step in the process is Grinding. Using 27' x 14' mills, either material can be ground to the consistency of beach sand or powder, without the addition of steel balls as is often used in other milling operations. Concentrating Magnetite only requires the addition of water and a strong magnet to separate the iron from the waste rock. This operation is performed in seperators known as cobbers and finishers. The waste rock and water is removed and becomes the mines "tailings". Seperating non-magnetic hematite involves an entirely different process. Caustic soda and cooked corn starch are used during and after grinding, along with water to collect all the fine-grained ore together in three-hundred 500 cubic foot flotation cells, called deslime thickeners. The thicker ore-starch-soda material sinks and the water and waste rock float off the top and are removed as tailings. At this point the material is dewatered and mixed with the proper amount of limestone and dolomite according to customer requirements. Steam is added to the hematite process as it is harder to dewater. In the pelletizing process the ore is rolled with bentonite clay (a binder) to marble size pellets in 12' x 33' balling drums. The produce at this time is called "green balls" and is then conveyed to a rotary kiln fired at 2200 degrees Fahrenheit. 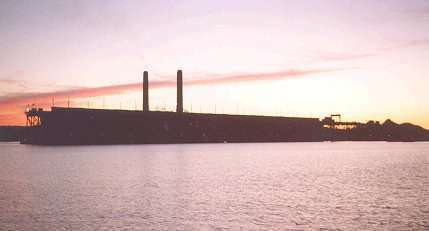 The kilns at Tilden are 25' x 160' and can burn natural gas, coal or oil as a fuel. The pellets are cooled and transported to the stockpile. 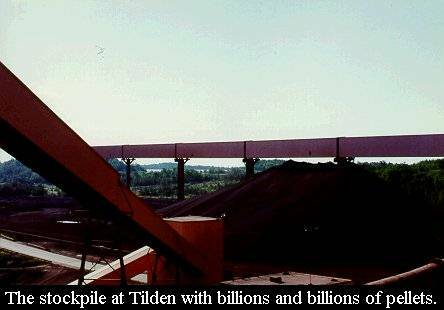 The Tilden stockpile has a capacity of 3 million tons of pellets. 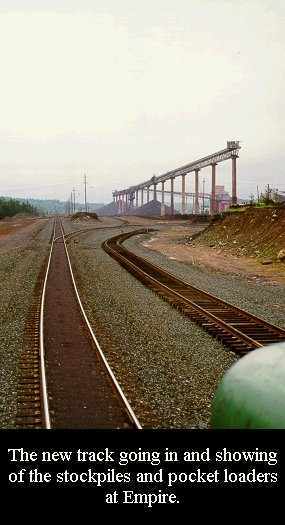 The loading yard can load 450 ore cars per day. The tailings at Tilden are conveyed to Gribben Basin where the water is recycled and reused and the tailings remain in the impoundment. The Empire Mine was first opened in 1964 and was enlarged in 1966, 1975 and again in 1980. 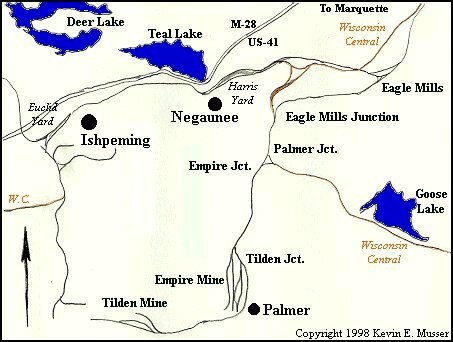 Empire Iron Mining Partnership is located in Palmer, Michigan and the mine produces 8 million tons of Magnetite pellets per year. The Cleveland-Cliffs Iron Company manages the mine and is a 22.5 percent owner. 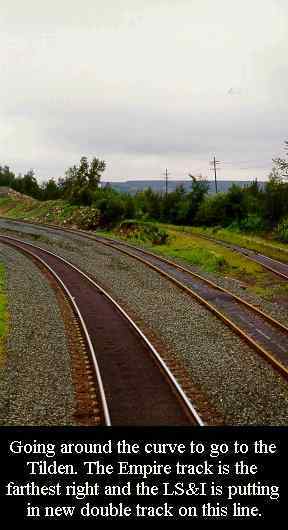 Other owners are Inland Steel Company, LTV Steel Company and Wheeling-Pittsburgh Steel Corp. 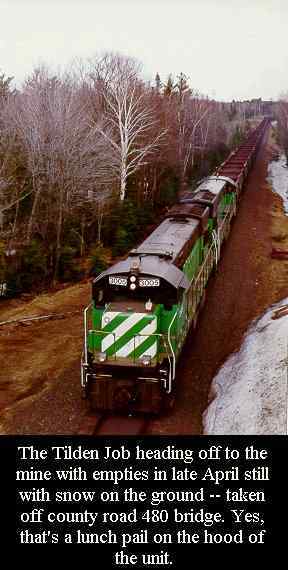 The Chicago & Northwestern hauled all the ore from this facility to the docks in Escanaba until 1989 when the LS&I began to haul ore as well to Presque Isle. 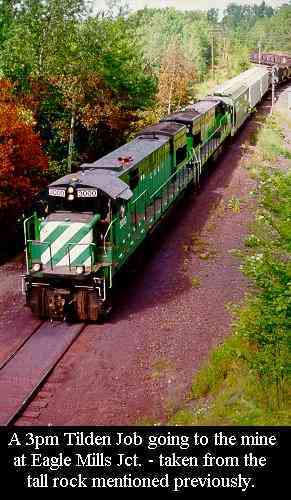 Today the C&NW traffic is handled by the Wisconsin Central. 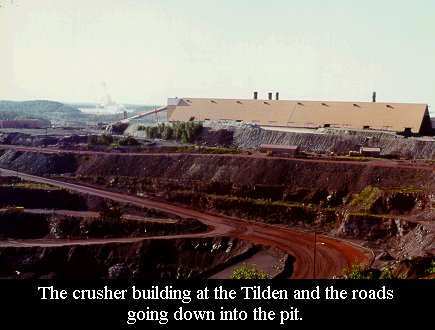 The Tilden Mine began operations in 1974 and capacity was doubled in 1979 to 8 million tons per year. 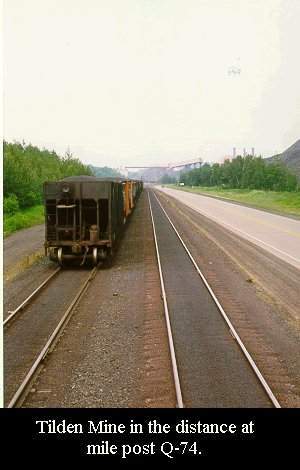 In 1989 the mine added processing capability to produce Magnetite ore by opening a new pit north of the main Hematite pit. Tilden Mining Company L.C. 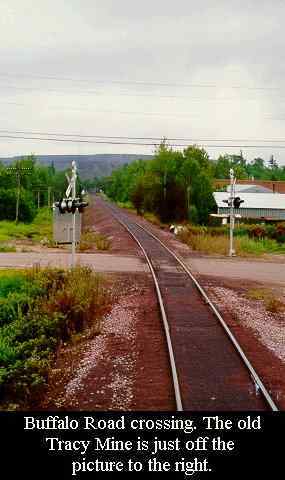 is located south of Ishpeming, Michigan and the mine produces 7 million tons of iron ore pellets per year. 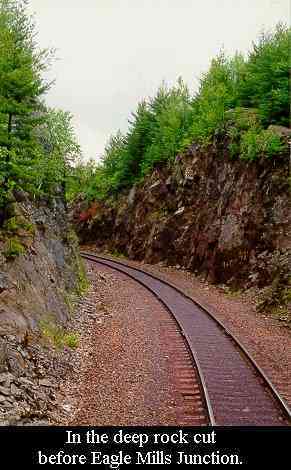 The Cleveland-Cliffs Iron Company manages the mine and is a 40 percent owner. 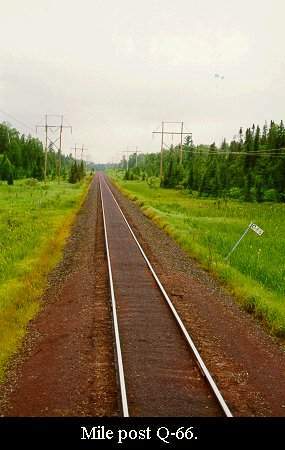 Other owners are Algoma Steel Inc. and Stelco Inc. The Tilden employs almost 1000 employees and contributes over 40 million dollars a year into the local economy just in paychecks. 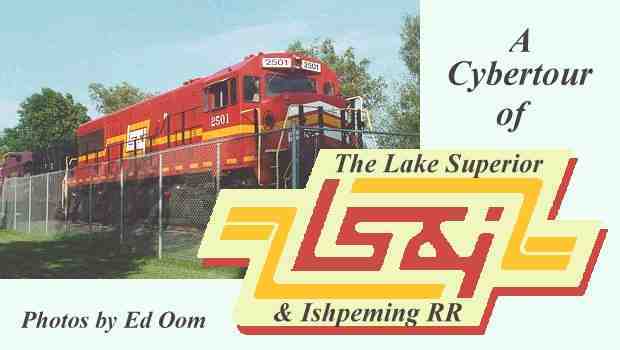 All ore from the Tilden is hauled by the LS&I. If you would like a copy of the map below at higher resoultion without the red dots, click here. The red dots on the map below reflect the general location of the photos. You can click on them to go directly to the location or follow the links below. As we are simulating the "Tilden Job" on this Cybertour, to make the most of the tour start at the Yard and proceed to Tilden Mine. Use your BACK button to return to the map. Click on the red dots below or follow the links under the map. A very nice aerial view of the Empire and Tilden Mine site. 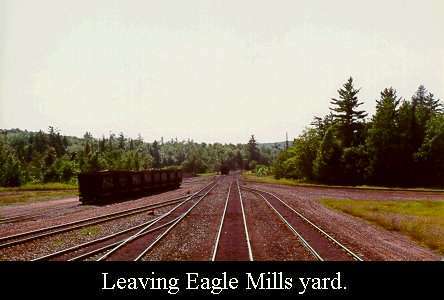 The west end of Eagle Mills yard. 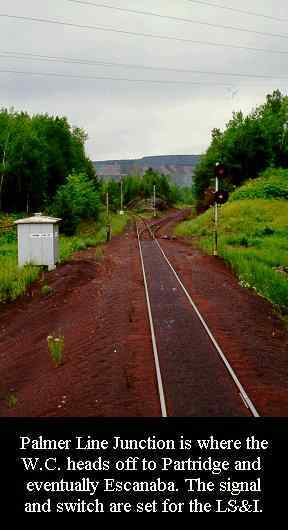 The red building is the operator's tower for the entire line. 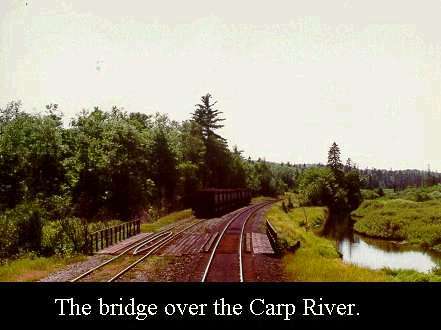 The bridge over the Carp River. The siding from Eagle Mills coming together with the main just before M-35. Approaching county road 480 and mile post Q-67. 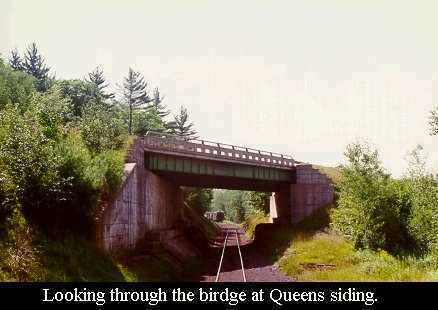 Looking through the bridge at Queens siding. The Tilden Job heading off to the mine with empties in late April still with snow on the ground - taken off county road 480 bridge. Yes, that's a lunch pail on the hood of the unit. The east end of Queens. The west end of Queens. The hoppers are loaded with paint ore. 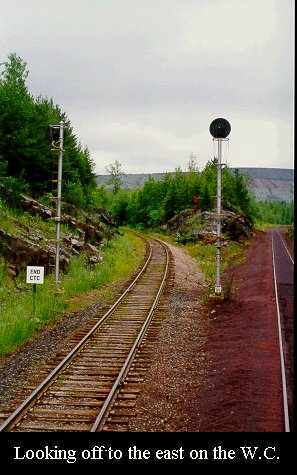 The fixed approach signal for Eagle Mills Junction. 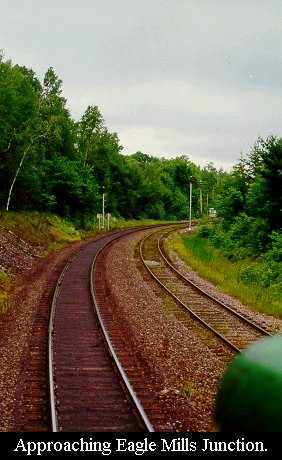 Approaching the deep rock cut before Eagle Mills Junction. 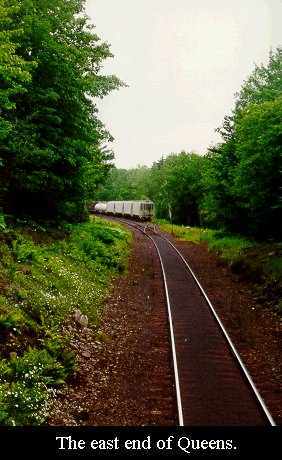 In the deep rock cut before Eagle Mills Junction. 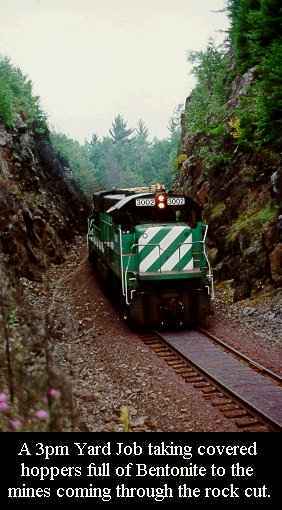 Coming out of the rock cut and the W.C. line from Ishpeming coming in at mile post Q-68. A 3pm Yard Job taking covered hoppers full of Bentonite to the mines coming through the rock cut. 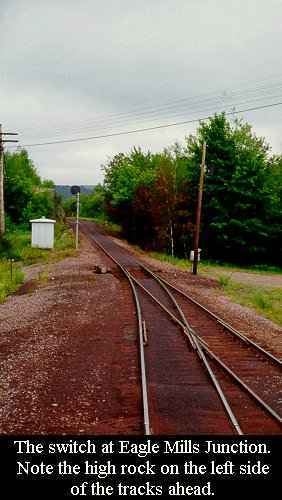 The switch at Eagle Mills Junction. 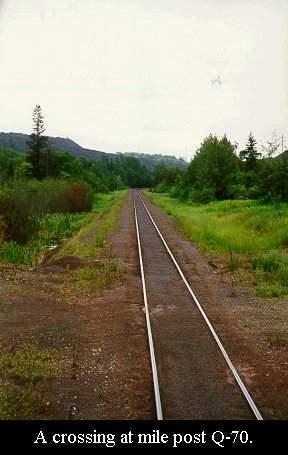 Note the high rock on the left side of the tracks ahead. 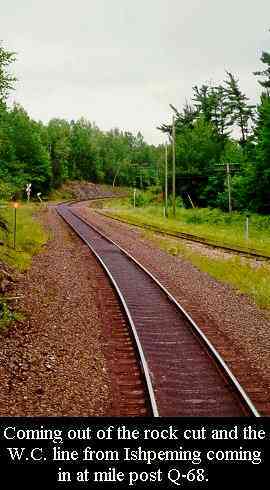 A 3pm Tilden Job going to the mine at Eagle Mills Junction - taken from the tall rock mentioned previously. Buffalo Road crossing. The old Tracy Mine is just off the picture to the right. 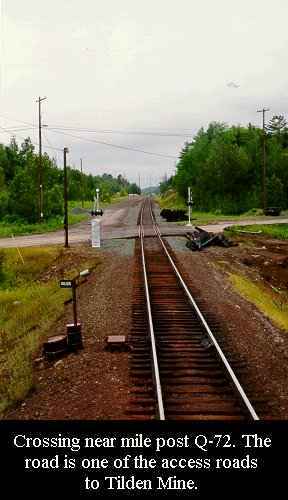 Palmer Line Junction is where the W.C. heads off to Partridge and eventually Escanaba. 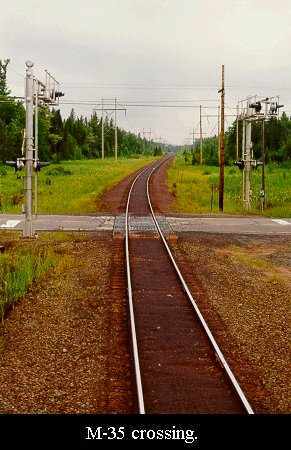 The signal and switch are set for the LS&I. Looking off to the east on the W.C. 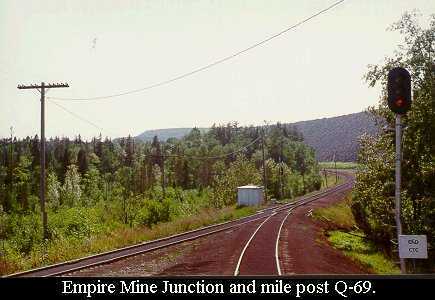 Empire Mine Junction and mile post Q-69. 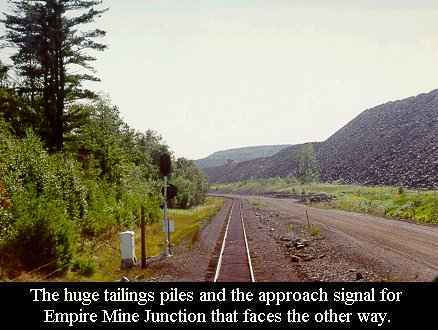 The huge tailings piles and the approach signal for Empire Mine Junction that faces the other way. 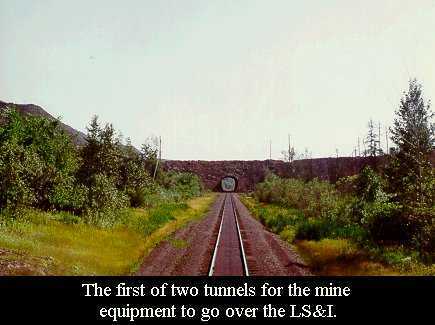 The first of two tunnels for the mine equipment to go over the LS&I. 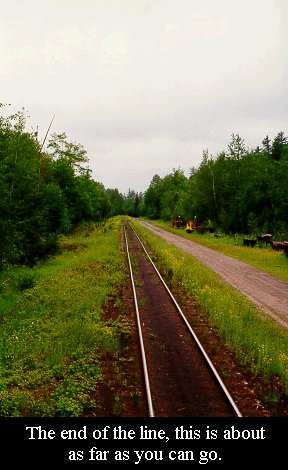 A crossing at mile post Q-70. 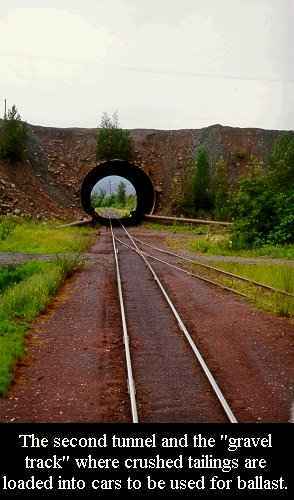 The second tunnel and the "gravel track" where crushed tailings are loaded into cars to be used for ballast. 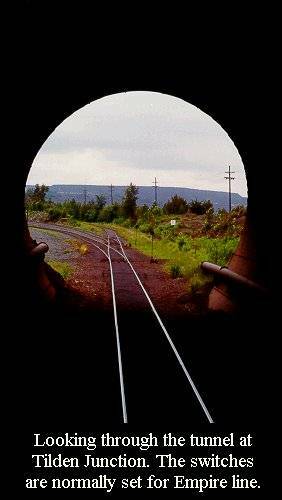 Looking through the tunnel at Tilden Junction. 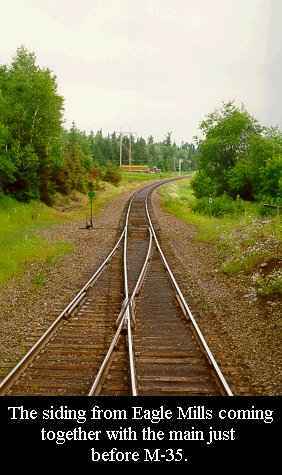 The switches are normally set for the Empire line. Going around the curve to go to the Tilden. 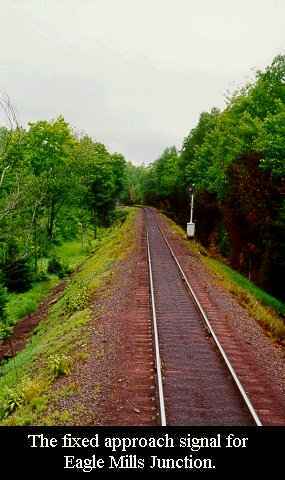 The Empire track is the farthest right and the LS&I is putting in new double track on this line. Empire Mine in the distance near mile post Q-71. 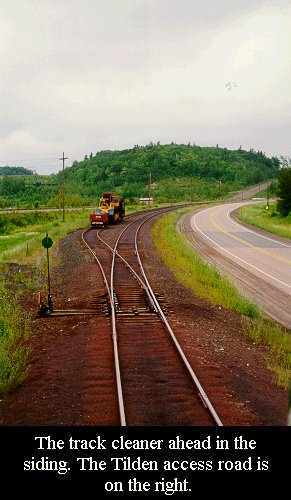 The track machinery will be working on the new track. The new track going in and showing more of the stockpiles and pocket loaders at Empire. 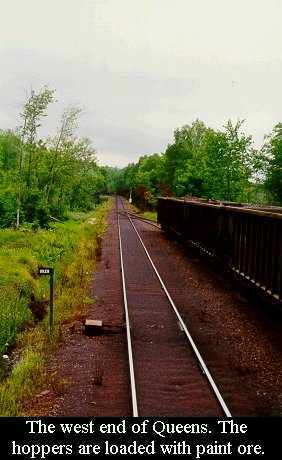 Crossing near mile post Q-72. 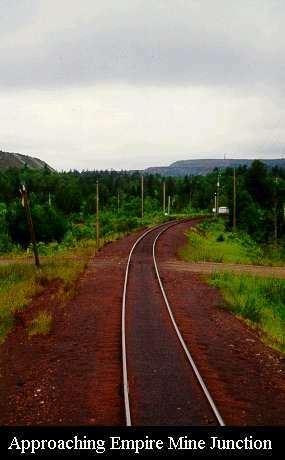 The road is one of the access roads to Tilden Mine. 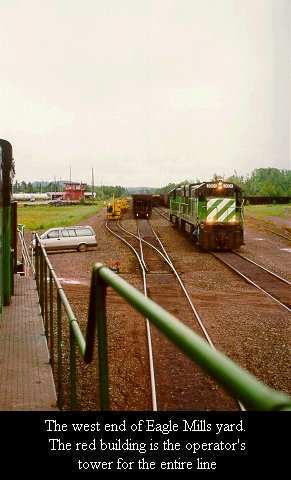 The track cleaner ahead in the siding. 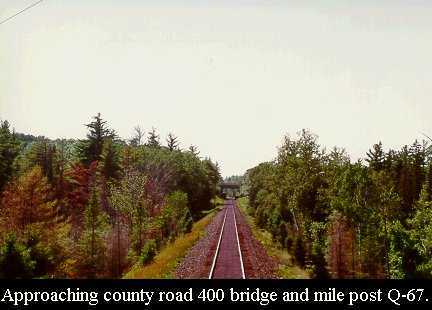 The Tilden access road is on the right. Tilden Mine in the distance at mile post Q-74. 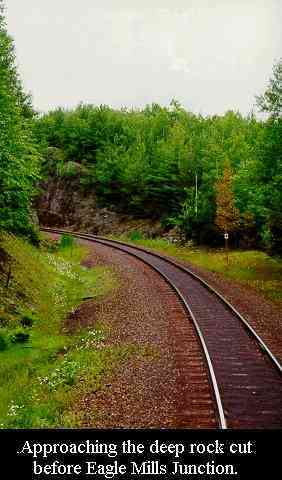 The end of the line, this is about as far as you can go. The stockpiles at Tilden with billions and billions of pellets. The crusher builiding at the Tilden and the roads going down into the pit. The Hematite pit with all the mining trucks and cranes in the pit.